Putin's Out Of The Club For Now: G-8 Is Back To Being The G-7 : The Two-Way President Obama and other leaders of the world's biggest industrialized nations say they're not going to summit with Russia in June. President Obama and other leaders met in The Hague. Clockwise from bottom left: European Union Council President Herman Van Rompuy, Canadian Prime Minister Stephen Harper, French President Francois Hollande, British Prime Minister David Cameron, Obama, German Chancellor Angela Merkel, Japanese Prime Minister Shinzo Abe, Italian Prime Minister Matteo Renzi and EU President Jose Manuel Barroso. Russia's 20 years of having a seat at the table when leaders of the world's most powerful industrialized nations meet came to at least a temporary end. President Obama and his counterparts from six other major nations announced in The Hague that because of Russia's actions in Crimea, "we will suspend our participation in the G-8." The announcement was not a big surprise. It was already clear that the other leaders would not attend the next scheduled meeting of the G-8, which had been set for June in Sochi, Russia. The U.S. and European Union have also tried to punish Russia by aiming some financial and travel sanctions at members of Russian President Vladimir Putin's inner circle. But by saying that "Russia's actions in recent weeks are not consistent" with the beliefs and responsibilities of major nations and that their nations won't take part in any G-8 activities "until Russia changes course," the leaders are trying to send yet another message to Putin about their objections to the way Russia has taken Crimea from Ukraine. Putin's foreign minister, though, pooh-poohed the other nations' announcement. "If our Western partners believe the format has exhausted itself, we don't cling to this format. We don't believe it will be a big problem if it doesn't convene," Sergei Lavrov told reporters. Obama and the other leaders in the newly reconstituted G-7 said they will hold a summit in Brussels instead of Sochi in June. As this official history spells out, world leaders have been meeting in annual group summits since 1975, when French President Valéry Giscard d'Estaing hosted the G-6. The other five countries that sent their leaders that year were Germany, Italy, Japan, the U.S. and the U.K.
Canada joined the club in 1977, creating the G-7. As the Iron Curtain started to come down, the former Soviet Union was invited to attend — but not to be a member — in 1991. 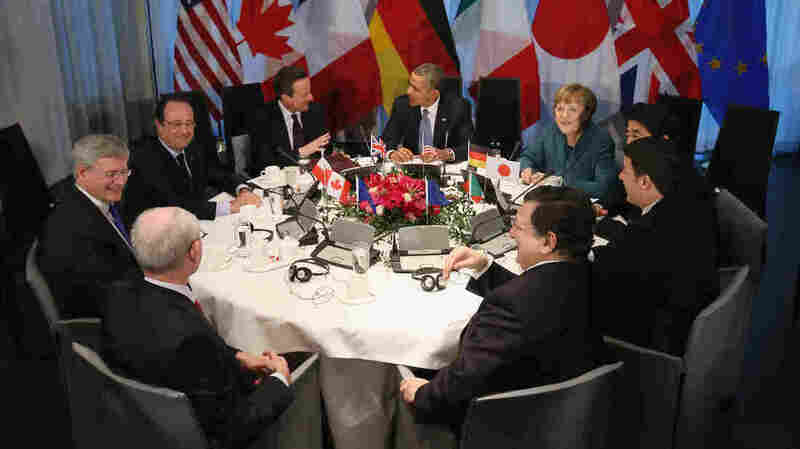 In 1994, the group was renamed the G-7+1 and in 1997 it became the G-8 when Russia became a full-fledged member. The crisis in Ukraine, though, has for the first time led to a member nation's exclusion from the group. Last week, after Crimeans voted to join the Russian Federation, Putin signed a treaty to annex the region. The U.S. and European Union have objected, calling that action a violation of international law. Putin says he is supporting Crimeans' right to "self-determination."